Continuing to provide $5.35 billion per year on average for provincial, territorial and municipal infrastructure under the New Building Canada Plan. Increasing the borrowing limits of the Government of the Northwest Territories to $1.3 billion and the Government of Nunavut to $650 million, upon approval of the Governor in Council. Providing an additional $750 million over two years, starting in 2017–18, and $1 billion per year ongoing thereafter for a new and innovative Public Transit Fund—the Government’s largest targeted infrastructure program—to promote public transit infrastructure investment in a manner that is affordable for taxpayers and efficient for commuters. Creating a new dedicated infrastructure fund to support the renovation, expansion and improvement of existing community infrastructure in all regions of the country as part of the Canada 150 celebrations. Continuing to build and renew federal infrastructure and on-reserve schools, including through $5.8 billion in investments over six years. Reviewing the usefulness of the rule that restricts federal pension funds from holding more than 30 per cent of the voting shares of a company. Infrastructure has served as the foundation on which Canadians have built this country. It carries the water we drink. It delivers our goods to markets across the world. It gets us to our jobs every morning and gets us home to see our families at the end of the day. Our quality of life, prospering communities and a resilient economy depend on our systems of public infrastructure. The Government of Canada is investing significant funding to ensure that Canadians continue to benefit from world-class infrastructure across the country. Our continued ability to compete successfully on the global stage depends on the quality of our public infrastructure. Whether in highways, water treatment, public transit or cultural facilities, investments in infrastructure help Canadian companies reach global markets, protect our environment and support our cities and communities. $33 billion through the 2007 Building Canada Plan, the first long-term, stable and predictable federal plan to provide funding to provinces, territories and municipalities to support their respective public infrastructure priorities. 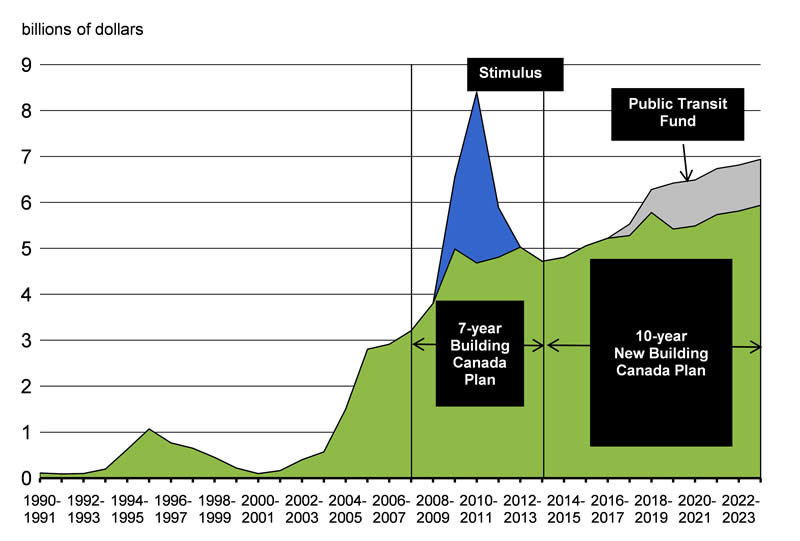 Its successor, the 10-year, over $53 billion New Building Canada Plan launched in 2014 (which includes $6 billion in funding from the 2007 Building Canada Plan). Infrastructure stimulus measures, which have supported 30,000 projects across the country, as part of the 2009 Economic Action Plan. The result is a dramatic increase in federal funding. 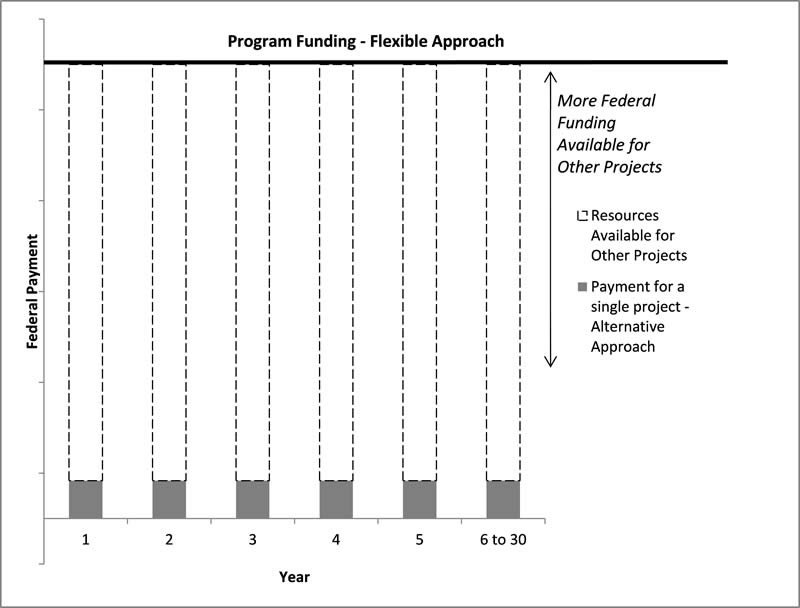 Annual federal support has increased from $571 million in 2003–04 to an estimated $5 billion in 2015–16 (Chart 3.4.1). Through Canada’s infrastructure funding programs, federal investments have supported over 22,000 projects in Canada that have created jobs and economic growth and contributed to a higher quality of life for Canadian families. Over the course of the 10-year New Building Canada Plan, the Government will provide $5.35 billion per year on average for provincial, territorial and municipal infrastructure projects. These unprecedented investments attest to the Government’s unwavering commitment to strengthen public infrastructure. Sources: Infrastructure Canada; Department of Finance. Over the past decade, provincial, territorial and municipal governments, with funding support from the Government of Canada, have taken great strides in responding to infrastructure investment needs and in building new infrastructure for a prosperous Canada. These sustained investments have increased the quality of public infrastructure available to Canadian families and businesses. Support from the Government of Canada has helped provincial, territorial and municipal governments contribute to the ongoing renewal and improvement of Canada’s core public infrastructure. 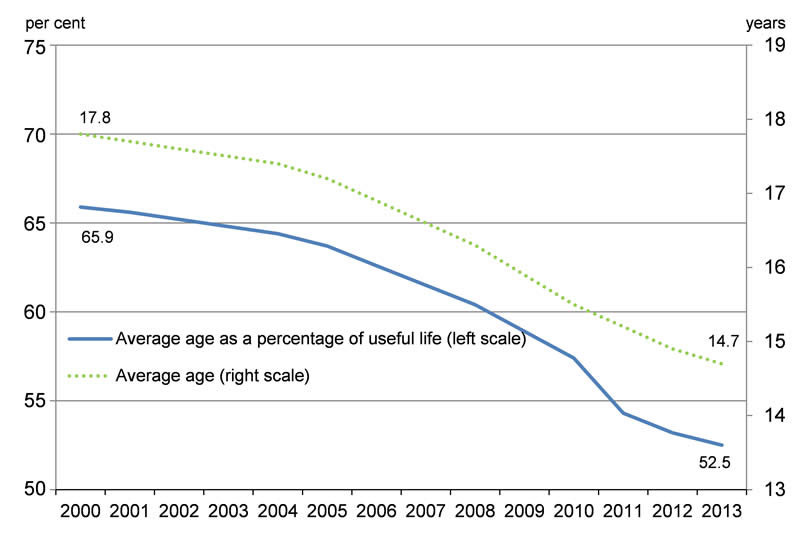 As a result, the average age of core public infrastructure is decreasing. From its peak of almost 18 years in 2000, the average age of core public infrastructure is estimated to have fallen to just under 15 years as of 2013 (Chart 3.4.2), its lowest age since data was initially collected in 1961. In addition, these investments are helping to lower the average age of infrastructure as a percentage of useful life. The useful life of an asset is its estimated productive life at the time of its acquisition. Between 2003 and 2012, the average age of Canada’s core public infrastructure as a percentage of useful life fell from 65 per cent to 53 per cent. Notes: Core public infrastructure (roads, bridges, transit, water, wastewater, culture, and sports and recreation infrastructure) owned by all levels of government including crown corporations and provincial agencies. Data for 2013 based on forecast. 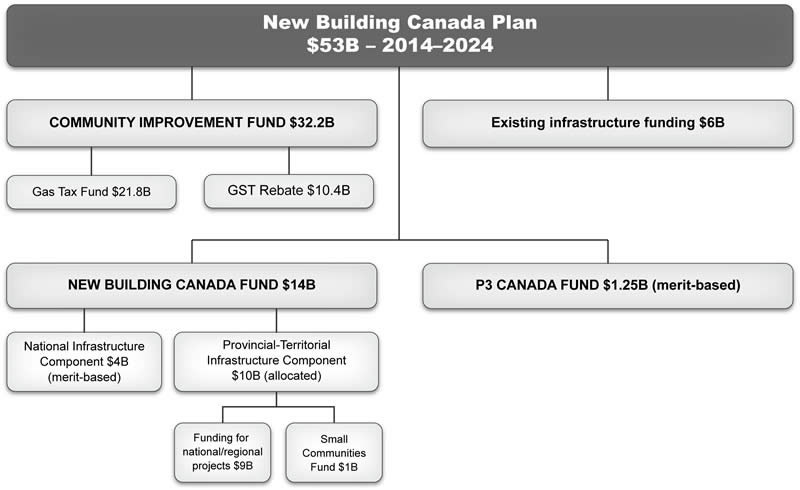 In March 2014, the Government of Canada launched the New Building Canada Plan. The Plan includes over $53 billion for provincial, territorial and municipal infrastructure over 10 years to help finance the construction, rehabilitation and enhancement of infrastructure—an average of $5.35 billion per year to support projects across Canada. It builds on the success of past federal infrastructure programs to promote economic growth, job creation, productivity gains and a high quality of life for Canadians. The Community Improvement Fund, consisting of the federal Gas Tax Fund and the incremental Goods and Services Tax Rebate for Municipalities, which provides over $32 billion to municipalities for projects such as roads, public transit, recreational facilities and other community infrastructure. The $14 billion New Building Canada Fund, which consists of the $4 billion National Infrastructure Component that supports projects of national significance and the $10 billion Provincial-Territorial Infrastructure Component for projects of national, regional and local significance. Of the $10 billion Provincial-Territorial Infrastructure Component, $1 billion is dedicated to projects in communities with a population of fewer than 100,000 residents. Funding that continues to be provided this year and beyond under existing infrastructure programs. Under the New Building Canada Plan, the majority of funding is allocated to the provinces and territories based on a balanced formula. This ensures that each province and territory will have access to a steady stream of federal support over the next 10 years to invest in infrastructure projects that respond to their local and regional needs. Under the Provincial-Territorial Infrastructure Component of the New Building Canada Fund, each province and territory receives a base funding amount of $250 million ($25 million per year over 10 years) plus a per-capita amount based on the 2011 Census. The federal Gas Tax Fund is allocated on a per-capita basis for provinces but provides a base funding amount of 0.75 per cent of total annual funding for Prince Edward Island and each territory. Through the New Building Canada Fund, the Government of Canada has approved federal funding for projects with over $5.7 billion in estimated total costs. In addition, billions of dollars continue to flow from existing infrastructure programs to important projects already underway across the nation, which are improving communities in every region of the country. Up to $5.7 million to support the replacement of the aging Souris Bridge, as well as three improvement projects for the National Highway System in Prince Edward Island. This will increase efficiency, mobility and safety for Prince Edward Island residents as well as ensure the economic growth of the region by improving the gateway to Souris and the ferry to the Magdalen Islands. The improvements of the National Highway System will also provide smoother and safer commuting for residents and visitors alike. Up to $20 million to support the rehabilitation of 130 kilometres of 100 series highways in Nova Scotia. This project will contribute to the quality of life of Nova Scotia residents by reducing commute times and facilitating access to goods and services throughout the province. Up to $43.7 million for the Port of Montreal to expand container facilities and deepen vessel berths, and for road works to increase the fluidity of truck traffic. This project will help ensure that the port facilities can support growth and meet increasing demand. Up to $660 million towards the extension of the Bloor-Danforth subway line in Toronto, Ontario. This project will reduce commute times for the residents of Scarborough and improve the quality of life of city residents. Up to $12.1 million towards the construction of a new water treatment plant in Headingley, Manitoba. This project will provide peace of mind and safe, clean water to thousands of families. Up to $22.8 million for the construction of 19.5 kilometres of new twinned highway in Saskatchewan from Saskatoon to the Village of Clavet, and the construction of a 7-kilometre bypass north of Clavet. This project will greatly improve the flow of traffic, expedite the transport of goods to market, ensure economic growth throughout Western Canada and allow local commuters to get home to their families more quickly. Public-private partnerships (P3s) can improve the delivery of public infrastructure for Canadians, provide better value for money and reduce risk for Canadian taxpayers. P3s work because they transfer a share of the risk associated with infrastructure projects to the private sector, including cost overruns, schedule delays and unexpected maintenance. 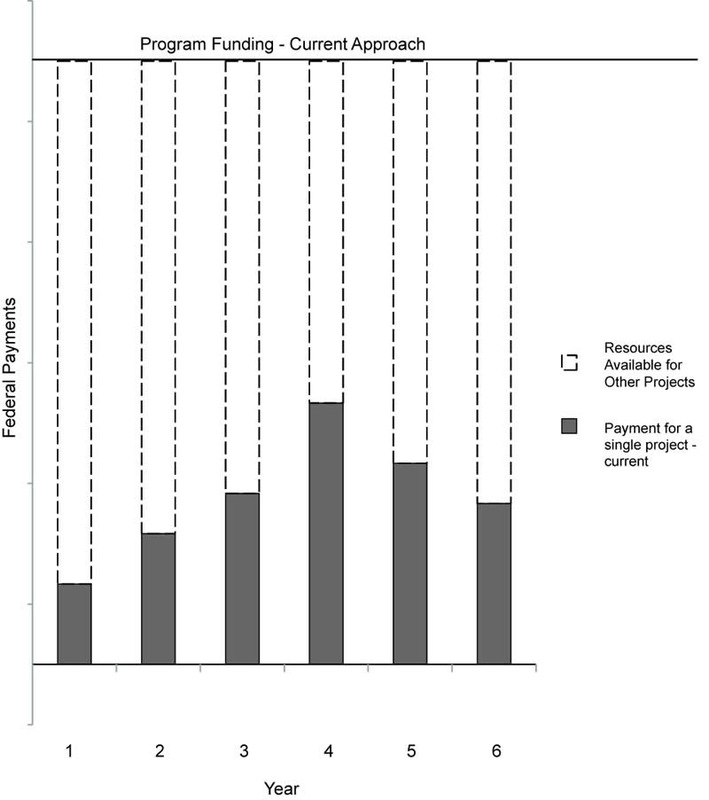 This provides an incentive for projects to be delivered on time and on budget. $137.3 million to support the Winnipeg Capital Integration Project, including Stage 2 of the Southwest Transitway and Pembina Highway Underpass project in Winnipeg, Manitoba. This project will improve transit reliability and travel times, and reduce congestion on local roads. $12.9 million through a preferential loan to support the Kokish River Hydroelectric Project in British Columbia. This project will help the ‘Namgis First Nation to build equity in the 45 megawatt run-of-the-river hydroelectric development located within their core territory, which will generate revenue for the ‘Namgis Community Benefit Fund. $48.4 million to support the construction of the Stoney Compressed Natural Gas Bus Storage and Transit Facility in Calgary, Alberta. This project will support the storage and maintenance of the city’s new fleet of Compressed Natural Gas buses, which will have a lower environmental impact and be less expensive to operate than traditional diesel fuel buses. $66.0 million to support the North Commuter Parkway and Traffic Bridge Replacement Project in Saskatoon, Saskatchewan. This project will restore a historic city landmark, reduce travel times and traffic congestion, and result in reduced greenhouse gas emissions and improved air quality for city residents. $200.0 million to support the Regina Bypass Project in Regina, Saskatchewan. This project will provide new roads, service roads and overpasses that will make travelling around Regina faster and safer. PPP Canada Inc., a federal Crown corporation, will continue to lead federal efforts in encouraging the use of P3s where they can generate better value for money. Executing complex P3 transactions can be a challenge for smaller jurisdictions. Bundling a number of small projects into one large P3 project can provide the necessary scale and opportunity to transfer risk to the private sector that underpins the quality of P3 projects. Some Canadian municipalities have already successfully launched bundled P3 projects. For example, Saskatoon’s Civic Operations Centre project included the relocation of the City’s transit operations facility and the construction of a permanent snow management facility. This innovative and cost-saving approach to project bundling allowed the City of Saskatoon to transfer project risks to the private sector and obtain better value for money for the projects than would have been the case had they been undertaken separately through a traditional model. Economic Action Plan 2014 announced that PPP Canada will increase its efforts to share best practices and promote the greater adoption of the P3 model in Canada, including providing smaller municipalities with information, guidance and tools to support P3s and promote the bundling of projects. PPP Canada continues to work with smaller municipalities and other orders of government to develop bundled P3 projects for future investment decisions under the P3 Canada Fund. The Corporation is also developing documents and templates to better assist small municipalities in the planning and execution of P3 projects. Each year, the federal Gas Tax Fund assists municipalities by providing flexible, stable and predictable funding for local infrastructure projects. Altogether, from 2005 to 2014, $13 billion was made available to municipalities for municipal priorities through this Fund. The Government of Canada has made significant improvements to the Gas Tax Fund. Through the 2007 Building Canada Plan, it was extended with funding doubling from $1 billion to $2 billion annually. In 2011, the Government of Canada legislated the federal Gas Tax Fund as a permanent source of infrastructure funding for municipalities. In Economic Action Plan 2013, the Government of Canada announced that the Fund would be indexed at 2 per cent per year, to be applied in $100 million increments, which means that it will grow by $1.8 billion over the next decade, with close to $22 billion to flow over the 10-year period of the New Building Canada Plan. Through the New Building Canada Plan, eligible investment categories under the Fund have been expanded to include tourism, sport and recreation, thereby giving municipalities additional flexibility. Since the launch of the New Building Canada Plan in March 2014, new agreements have been signed in all provinces and territories and all of the $2 billion annual allocation for 2014–15 has been made available to municipalities for municipal infrastructure priorities. By transferring $2.76 billion to local governments over the next decade, the federal Gas Tax Fund is making a significant contribution to the core infrastructure in our communities. The Gas Tax Fund has already supported more than 2,000 local projects in B.C. This new agreement will help build thousands more. The federal Gas Tax Fund is playing a vital role in funding the renewal of infrastructure in our community. The federal government’s commitment to supporting local initiatives allows communities such as ours the opportunity to upgrade facilities that would otherwise be problematic to complete on our own. The Government is working with all provinces and territories on priority infrastructure projects they identify for funding under the New Building Canada Fund. PPP Canada launched Round 7 of its calls for applications under the P3 Canada Fund on April 13, 2015, and will announce support to additional innovative P3 projects over the course of 2015–16. The Government will continue to flow over $6 billion from the original Building Canada Plan and other government infrastructure programs. Federal infrastructure programs that pre-date the New Building Canada Plan supported over 2,500 projects across Canada in 2014 alone. The Government of Canada calls on all provinces and territories to work with the federal government to quickly identify infrastructure projects that are priorities for Canadians and get more shovels in the ground across the country. Economic Action Plan 2015 proposes to increase the borrowing limit for the Government of the Northwest Territories to $1.3 billion and for the Government of Nunavut to $650 million, upon Governor in Council approval. The Government of Canada remains committed to promoting economic development in the North. Increasing the borrowing limits will give the territories greater flexibility in their fiscal planning as they consider future investments, including in infrastructure, to support ongoing resource development and economic growth. This is consistent with the Government of Canada’s Northern Strategy and is yet another step towards unlocking the North’s economic potential. The Government of the Northwest Territories and the Government of Nunavut have both requested that the Government of Canada increase their borrowing limits. Following a review of each territory’s economic and fiscal outlooks, the Government of Canada is proposing to increase the borrowing limits of both the Government of the Northwest Territories and the Government of Nunavut. 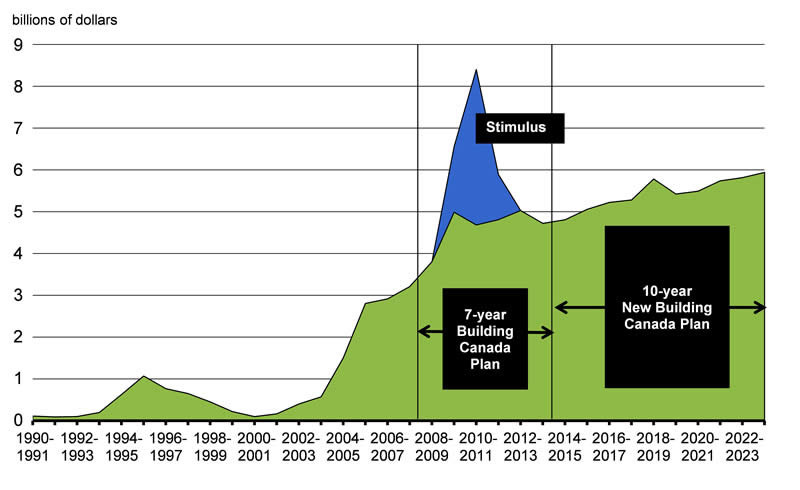 Upon Governor in Council approval, it is proposed that the borrowing limit for the Government of the Northwest Territories be increased from the current level of $800 million to $1.3 billion and that the borrowing limit for the Government of Nunavut be increased from the current level of $400 million to $650 million. This additional borrowing room would support these governments in their planning to grow their economies and promote Northerners’ long-term prosperity. Economic Action Plan 2015 proposes to provide $750 million over two years, starting in 2017–18, and $1 billion annually ongoing thereafter for a new Public Transit Fund. With the growth and urbanization of our country and ever-improving technology, public transit in Canada has changed significantly over time. Vancouver opened the first electric street car service over a century ago in 1890. Toronto opened Canada’s first subway line in 1954 to accommodate the growth of the city. That was followed by Montreal’s 1966 inauguration of its subway system. The growth and expansion of these transit systems have been instrumental in the development of our largest cities. Large cities in Canada depend on public transit infrastructure to facilitate the mobility of people and goods and support economic development. Strong and efficient public transit networks help get people to their jobs, students to class and all citizens out in their community to see family and friends. Public transit also helps to reduce overall urban congestion, which helps to get goods to markets faster and supports productive and growing cities. Governments at all levels have been investing in public transit projects that will further modernize our transit systems. Since 2006, the Government has provided unprecedented support for public transit, committing close to $5 billion for public transit projects across the country that have been identified as priorities by municipalities, provinces and territories. In addition, $3 billion of the funding under the Gas Tax Fund has been used by municipalities for public transit projects since 2006. All provinces, territories and municipalities can access funding under the New Building Canada Plan for their public transit priority projects. This has not only helped build better transit, but has also built strong partnerships among all levels of government. These efforts have meant tangible improvements to public transit all over Canada, such as new and expanded transit systems, larger fleet sizes with more accessible vehicles and the capacity to handle increasing ridership. As a result, more and more Canadians can count on modern and efficient transit systems in their community. $697 million for the Toronto-York Spadina Subway Extension project in Toronto, Ontario. This project is extending the current Spadina line by 8.6 kilometres into the city of Vaughan, providing residents with rapid, reliable connections to GO Train services and six new subway stations, including one at York University. 12.5-kilometre electric light rail system that will cross the city. The line is currently under construction, and will help improve comfort and reliability of the city’s transit system, help reduce traffic congestion, and reduce travel times and pollution once fully operational in 2018. $416.7 million for the construction of the Evergreen Line in Metro Vancouver, British Columbia. The new line, which is currently under construction, will be linked directly to the existing Millennium Line, with connections to other transit lines and regional bus networks. The project will generate jobs, connect communities and provide more transportation options for families. $400 million for the construction of the Edmonton Valley Line (Stage 1) Southeast Light Rail Transit in Edmonton, Alberta. Once built, the line will integrate directly into existing light rail transit and other transportation networks, and will help make the city a more mobile, efficient and attractive place to live, learn and work. $265 million for the construction of a new light rail rapid transit system between the Ontario cities of Waterloo and Kitchener as well as a rapid bus transit from Kitchener to Cambridge. The project will provide a frequent, reliable, convenient and environmentally friendly way for local residents to travel around the Region of Waterloo, and support local economic development and job creation. In Canada’s largest cities, major public transit improvements are needed to reduce urban congestion and the cost of gridlock for our businesses, in cities and across the country. Building on the Government’s investments in public transit to date, Economic Action Plan 2015 proposes to introduce a new and innovative fund to promote public transit infrastructure investment in a manner that is affordable for taxpayers and efficient for commuters. Economic Action Plan 2015 proposes to provide PPP Canada Inc. with new funding of $750 million over two years, starting in 2017–18, and $1 billion per year ongoing thereafter for a new Public Transit Fund. This new Fund will complement the Government’s existing infrastructure support by providing significant long-term support for public transit projects that can improve the mobility of goods and people and provide broad economic and social benefits to Canadian cities. In recent years, governments have learned that involving the private sector in the design, building, financing and operation of infrastructure projects can generate better value for money. Under P3 arrangements, governments benefit from the expertise of the private sector in project planning and delivery. The private sector also assumes a share of project risks. This risk transfer, which is anchored by private capital at risk, incents the private partner to deliver projects on time and on budget and to minimize costs over the full life cycle of an asset. Since 2006, the Government has achieved success in promoting the use of P3s for the delivery of infrastructure projects in Canada where it makes sense to do so, including through targeted investments under the P3 Canada Fund. There are a number of existing projects across the country that are being successfully implemented, such as the Edmonton Valley Line project, that demonstrate that alternative approaches and working with the private sector produce value for taxpayers. 30-year contract. Based on thorough analysis, the City of Edmonton concluded that a P3 will deliver value for money. The design, build, finance, operate and maintain model is an innovative approach to P3 procurement for public transit projects in Canada, and is allowing the City of Edmonton to transfer significant risks over the entire lifecycle of the project to the private sector, allowing the City to realize greater value for taxpayers’ dollars. The project, currently in procurement, has received significant interest from the private sector and construction is expected to begin this year. The Government of Canada is contributing $400 million to the project through the P3 Canada Fund and the New Building Canada Fund. The Lincoln Station Project in Coquitlam, British Columbia will result in an additional station built as part of TransLink’s new Evergreen Line. In recognition of the private sector development that would arise from the project, the City of Coquitlam and Pensionfund Realty Limited (a privately held real estate company) struck an innovative funding partnership that includes private sector funding to help pay for the construction of the new transit station, including the platform, plaza area, operational facilities and ticketing machines and fare gates. The construction of Lincoln Station will encourage greater use of public transit, and support economic development in the area. It will bring more rapid transit access to this fast growing area of Coquitlam, improve transit linkages and reduce traffic congestion. The Government of Canada is providing $7 million to the project through the P3 Canada Fund. Other alternative approaches involving private sector financing and funding for infrastructure have been used internationally, and are now being explored in Canada, which could offer significant benefits in terms of affordability and efficiency. Public transit projects that include a commercial perspective can result in more effective project execution and outcomes, such as the optimization of transit routes and stations based on the needs of riders, and the maximization of ancillary revenues from the project, which can serve to offset project costs. Under the new Public Transit Fund, federal support will be allocated based on merit to projects that will be delivered through alternative financing and funding mechanisms involving the private sector that demonstrate value for money for taxpayers, including P3s. The Government will continue to explore innovative financing and funding mechanisms, and flexible payment arrangements, for infrastructure assets through targeted consultations with key stakeholders so that Canadians continue to benefit from quality, high-performing infrastructure. For example, the Government will consider providing a stream of predictable payments over a 20-30 year period rather than upfront contributions. Provinces, territories, municipalities or other partners would be able to borrow against this predictable payment stream. Based on precedence and current market conditions, it is estimated that $1 billion per year in dedicated public transit funding could generate up to $65 billion in capital contribution over the next decade (Chart 3.4.4). The Government will announce further details about program parameters for the Public Transit Fund later this year. Under the new Public Transit Fund, federal support will be allocated based on merit to projects that will be delivered through alternative financing and funding mechanisms involving the private sector that demonstrate value for money for taxpayers, including P3s. The Government will adopt a flexible approach to delivering payments under the proposed new Fund. As appropriate, the Government will consider providing payments over an extended period of time, for example, over the useful life of the public transit assets or over the typical term of provincial or municipal debt issued to finance construction costs. This approach will provide a predictable stream of payments over several years that provinces and municipalities can borrow against, providing greater financial flexibility to raise sufficient funds to move forward with greater infrastructure investments in the short term. The chart below demonstrates this concept. It shows a $1 billion federal contribution funded through normal contributions. It also shows the same $1 billion federal contribution spread out over 25 years in annual payments. This approach allows more federal funding to be available to support more public transit projects. Building on the over $53 billion investment in provincial, territorial and municipal infrastructure under the New Building Canada Plan, the proposed new Public Transit Fund brings total federal spending on provincial, territorial and municipal infrastructure to around $60 billion over the 10-year period of the New Building Canada Plan. Economic Action Plan 2015 proposes to create a new dedicated infrastructure fund to support the renovation, expansion and improvement of existing community infrastructure in all regions of the country as part of the Canada 150 celebrations. Community-based facilities contribute to the quality of life in small communities and large urban centres across Canada. The 150th anniversary of Confederation provides Canadians with an opportunity to celebrate Canada’s history, heritage, values and future by reinvesting in community infrastructure across the country, similar to the important infrastructure investments made as part of our nation’s centennial celebrations in 1967 which can still be seen in communities today. Economic Action Plan 2015 proposes to create a new dedicated infrastructure fund to support the renovation, expansion and improvement of existing community infrastructure in all regions of the country. These new investments, which will be cost-shared with municipalities, community organizations and not-for-profit entities, will support projects that celebrate our shared heritage, create jobs and improve the quality of life of Canadians from coast to coast to coast. The Government will announce further details on the Canada 150 Community Infrastructure Program over the coming months. The Government of Canada is the custodian of a broad range of infrastructure assets that play a critical role in delivering core services to Canadians, improving the safety and security of our borders, enabling the safe and efficient movement of people and goods, supporting science and innovation, and providing access to our national parks. The Government is committed to maintaining and improving federal infrastructure across the country, ensuring that it continues to support the health, safety, cultural heritage and economic prosperity of all Canadians. The Government is providing $5.8 billion on a cash basis over six years, starting in 2014–15, to build and renew infrastructure assets and on-reserve schools across the country. In November 2014, the Government announced $5.8 billion on a cash basis over six years, starting in 2014–15, in new investments to build and renew infrastructure assets and on-reserve schools across the country. These investments will modernize and repair important federal infrastructure assets, provide employment opportunities in communities across Canada and support services to Canadians that in turn contribute to Canada’s long-term economic prosperity. $2.8 billion to support infrastructure improvements to heritage, tourism, waterway and highway assets located within national historic sites, national parks and national marine conservation areas across Canada. $500 million for the repair and construction of on-reserve schools. $452 million to repair and upgrade Canadian Armed Forces facilities. $440 million to expedite the replacement of border infrastructure. Approximately $400 million to maintain, upgrade and construct federally owned buildings and other assets across Canada. $380 million for major repairs and upgrading of federal laboratories and research facilities. $288 million for repair and maintenance of small craft harbours. $204 million to support enhancements to federally owned and operated airports as well as improvements to VIA Rail Canada Inc.’s rail infrastructure. $191 million to undertake renewal and repairs of heritage and museum sites. $183 million for the repair and procurement of vessels and small craft for the Canadian Coast Guard and Fisheries and Oceans Canada to support activities including search and rescue, science and conservation. This federal investment is a long-term commitment to building and maintaining a world-class infrastructure advantage in Canada. A large number of projects will be underway in the 2015 construction season, creating jobs and improving the quality of life of all Canadians. $110.5 million on a cash basis to the National Arts Centre for the architectural renewal of the Centre, which will transform this important national cultural institution into a world-class facility that is welcoming and inviting, and that proudly symbolizes the excellence of the performing arts in Canada. $80.5 million on a cash basis to the Canada Science and Technology Museum to repair, retrofit and renovate the museum, which will result in a modernized institution that will highlight Canada’s long history of scientific and technological achievement and inspire our youth to become future innovators. $45.7 million on a cash basis to improve and expand critical infrastructure for the Canadian Armed Forces at 4 Wing Cold Lake, including construction of a new health services centre, modernizing and repairing military housing, and repairing the airfield. These investments will enable Canadian Armed Forces personnel to train and operate successfully as they defend the safety and security of Canadians. New resources through the Parks Canada Agency to undertake the restoration of three important historic landmarks in Québec City: the walls around Old Québec, the Dauphine Redoubt military fortifications and elements of the Maillou House National Historic Site. Restoration activities will help ensure that the history, culture and beauty of Québec City are respected and preserved for the enjoyment of Canadians and international visitors for years to come. On April 15, 2015, the Government of Canada announced that Signature on the Saint-Lawrence Group had been selected as the preferred proponent for the construction of the New Bridge for the St. Lawrence, under a P3 arrangement. This step marks a major milestone towards having the new bridge in service by 2018. Within a few months, Signature on the Saint-Lawrence Group will begin construction on one of the largest infrastructure projects in North America. The New Bridge over the St. Lawrence is expected to create 30,000 high-quality jobs and promote economic growth in the Montreal area and across Canada. Canada is home to some of the world’s largest and most experienced private sector infrastructure investors. These investors include pension funds. To reduce red tape and improve the investment climate in Canada, the Government will undertake a public consultation on the usefulness of the rule that restricts federal pension funds from holding more than 30 per cent of the voting shares of a company.